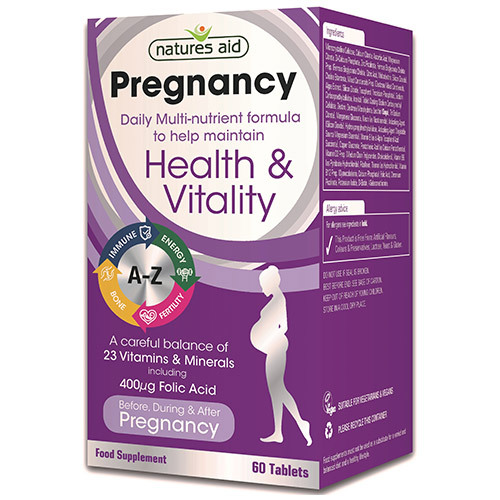 Natures Aid Pregnancy is a carefully balanced multi-vitamin and mineral complex for nutritional support; before conception, during pregnancy and whilst breastfeeding. Microcrystalline Cellulose, Calcium Citrate, Ascorbic Acid, Magnesium Citrate, Di-Calcium Phosphate, Zinc Picolinate, Ferrous Bisglycinate Chelate Prep. (Ferrous Bisglycinate Chelate, Citric Acid, Maltodextrin, Silicon Dioxide), Choline Bitartrate, Mixed Carotenoids Prep. (Dextrose Mixed Carotenoids, Algae Extract, Silicon Dioxide, Tocopherol, Tricalcium Phosphate), Sodium Carboxymethylcellulose, Inositol, Tablet Coating (Sodium Carboxymethyl Cellulose, Dextrin, Dextrose Monohydrate, Lecithin (Soya), Tri Sodium Citrate), Manganese Gluconate, Niacin (as Nicotinamide), Anticaking Agent (Silicon Dioxide), Hydroxypropylmethylcellulose, Anticaking Agent (Vegetable Source Magnesium Stearate), Vitamin E (as d-Alpha Tocopherol Acid Succinate), Copper Gluconate, Pantothenic Acid (as Calcium Pantothenate), Vitamin D3 Prep. (Medium Chain Triglycerides, Cholecalciferol), Vitamin B6 (as Pyridoxine Hydrochloride), Riboflavin, Thiamin (as Hydrochloride), Vitamin B12 Prep. (Cyanocobalamin, Calcium Phosphate), Folic Acid, Chromium Picolinate, Potassium Iodide, D-Biotin, l-Selenomethionine. If you are taking any prescription medication or have a medical condition, consult your healthcare professional before taking this product. 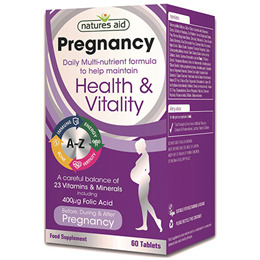 Below are reviews of Natures Aid Pregnancy Multivitamins & Minerals - 60 Tablets by bodykind customers. If you have tried this product we'd love to hear what you think so please leave a review.